We specialize in a variety of indoor and outdoor signs for everything from your convention to your company golf outing. The PSSI creative team creates signage that will reflect your brand message, and ensure that the first impression is a lasting one. Posters and signs with various mounting options, changeable signs, geometrix fabric displays, portable banner stands, kiosks and customized backdrops will guarantee that your business is recognized everywhere. Customized signs to meet your every need. Mounting options for signs include foamcore board, gator board, ultra board and PVC plastic. Economical and sturdy but not recommended for multiple-use signs. A combination of foam and gator board. More durable than foam board but less expensive than gator board. A rigid and lightweight substrate recommended for multiple-use signs. A durable option and suitable for long lasting applications. A great product that allows you to quickly swap out meeting information in a convenient pocket. Saves time and money. This flexible sign system allows you to change out your information on the fly. Make changes to your file, print it out and replace the artwork in the clear pocket mounted on the face. Tada! You have a new sign! 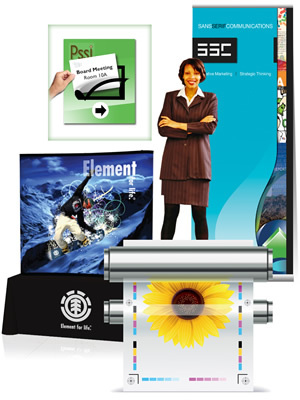 Banners can be displayed using portable retractable or collapsible stands. These highly portable banners are an easy and economical solution to your display needs whether for your retail space, office or next conference. Retractable and lightweight, these banner stands take up little space and are easy to travel with. The banner display itself is modern, streamlined and can be customized with eye-catching graphics. Get noticed with an indoor or large outdoor banner. Vinyl banners can also come equipped with grommets for easy hanging. Durable vinyl indoor and outdoor banners are a great way to get your message across. Full-color banners can include photos, logos and colors of the rainbow, providing maximum impact for your investment. Text-only banners are an economical choice, can be nice and simple but still provide impact. Exhibit at your next conference or trade show and stand out with one of the many PSSI options. With innovative and smart design implemented to your display exhibits, you will stand out from the crowd at your next event. These display exhibits come in different sizes to fit your needs. Whether it be a table top or a floor display, these are easy to assemble and are highly portable.